"Augmented Reality for Smartphones" is a 50 pages-long report that analyzes many popular AR platforms in order to give developers better perspective on what's available in the market today. Computer vision (2): Raimo van der Klein gives an excellent talk on why computer vision, like biological vision at the time, will start an evolutionary arms race - Birth of the Digital Eye. Computer vision (3): IQ Engines is a cool startup, offering "vision as a service". I've tried their mobile application, and it is amazing at recognizing objects - but also usually slow, because it is still partially based on humans behind the scenes. Finally, if you ever find yourself confused by IKEA's instructions, there will be an app for that (maybe). This week's video was featured on Bruce Sterling's Beyond the Beyond, but if you missed it, here's your opportunity. It's in French, and depicts a modern fairy tale, made possible by augmented reality. Luckily you don't need to know French to follow the story, and I find it only adding to the video's allure. (However, I'll be thankful if you can translate the old guy at the end of the video in the comments). Things start to get interesting as Vuzix announces partnership with Metaio. This only a few days after we learned that Vuzix will provide DARPA with their glasses. If you are still debating whether to go to Augmented Reality Event 2011, Tish Shute has a good writeup on what you can expect to see there (and a $100 coupon). Brazilian police to use "Robocop" glasses to recognize criminals and terrorists in crowds? Sounds like a hoax, but this article, and the one on which it is based, were written after April fools. GoldRun raises one million dollars. 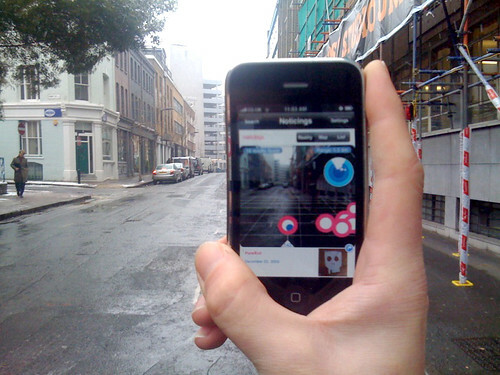 Augmented reality from the perspective of a creative director is it a gold mine or black hole? This week's video comes to us from Nokia Research, showing their indoor navigation solution. Coming from Nokia Research, one of the first bodies to look into mobile AR, this should be considered as no more than a teaser. It's very cool and alluring with its 30cm accuracy, and its "where I put my keys" functionality, but not likely to be adopted anytime soon. Five years from now, Apple/Google will probably come with inferior solution which will be hugely successful. You can read more about the technology on GSM Arena. With Easter just around the corner, we are undoubtedly facing a round of festive augmented reality applications. While last year saw the creation of GPS based applications such as "AR Easter Egg Hunt", this year brings computer-vision based applications, and leading the pack is Irregular Apps' "Talking Augmented Easter Egg". When I tested the application on my iPhone 3GS, it surprisingly worked well. The tracking was a bit jumpy (as you might expect), but it did identify my "test egg", even with a few decoys around (like a white charger). True, it's a gimmick, that will lose its attraction in a few weeks (unless you are an angry bird, using the app to track your stolen eggs), but it's probably make your kids quite happy for those few days. More details can be found on Irregular Apps' website. If you are a user of one the mobile AR applications, such as Layar, Junaio, Wikitude, Google Goggles (or any of the many others), and would like to help the (academic) research of augmented reality, boy do Markus Salo and Thomas Olsson have an offer for you. The two researchers from Finland ask you to think about your most satisfying and unsatisfying experiences using AR application, and for your view on the usefulness of such applications and take the following survey. I must say that imho, mobile AR has not yet created a really satisfying moment, and the enjoyable moments it did create, didn't last for long (though, some of the creative things people do with mobile AR are really mind boggling). Best of all, by participating in this survey, you enter a raffle to win one of 10 Amazon-vouchers, 50 euros of worth each. Considering that AR is still a niche, you have pretty good chances to win it. Even better, Salo has promised to share the results, so we'll can all learn from this survey. Wow, what a busy week. I've listed below only a few of this week's AR related news stories, just to protect you from an information overload. I hope to blog about the other stories in the coming days. Pipe dream or a dream just waiting to come true? Gotham Eyewear: "What are we building? We are building augmented reality glasses for the masses. Last week's video featured Predator, a really cool looking computer vision tracking algorithm. Now, its creator, Zdenek Kalal, has released it as open source. The Next Web published a list of "The 25 most influential people tweeting about augmented reality". I'm there, and actually if you are on Twitter and enjoy this blog, you should follow me. Suwappu - I just don't get it. This week's video is magnificent in its simplicity. Nothing more than a demo of Qualcomm's AR platform, featuring virtual domino bricks, it made me think what would happen if they'll scale this game. Anyone in the world could place bricks, and anyone could push a brick and start a world-wide chain reaction, but of the playful kind. A simple game that will cross borders and cultures, or maybe I'm a walking cliche? If you have any programming in the last year, you surely know of StackOverflow.com. Now there's an attempt to create a similar Q&A site for augmented reality. If you think this idea has any merit then show your support. Marketing with Augmented Reality - an Infographic (via @comogard). April fools: AdBlock Freedom - augmented reality eyewear that detects and removes ads from the world in realtime. Probably the guys at AdBlock never heard of Artvertiser. I love videos done by students to show off their work. This week we are lucky to have Predator, a very impressive video (though I haven't tried it myself) tracking algorithm resulting from Zdenek Kalal's phd thesis at the University of Surrey, UK. You can try it yourself by downloading a compiled application to your pc, and read more about it here. Though desktop bound right now, Kalal claims that "implementation for mobile devices is feasible".